Modernism is hot again. At the dawn of the twenty-first century, poets and architects, designers and critics, teachers and artists are rediscovering the virtues of the previous century’s most vibrant cultural constellation. Yet this widespread embrace raises questions about modernism’s relation to its own success. Modernism’s “badness”—its emphasis on outrageous behavior, its elevation of negativity, its refusal to be condoned—seems essential to its power. But once modernism is accepted as “good” or valuable (as a great deal of modernist art now is), its status as a subversive aesthetic intervention seems undermined. 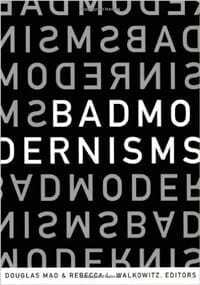 The contributors to Bad Modernisms tease out the contradictions in modernism’s commitment to badness. Bad Modernisms thus builds on and extends the “new modernist studies,” recent work marked by the application of diverse methods and attention to texts and artists not usually labeled as modernist. In this collection, these developments are exemplified by essays ranging from a reading of dandyism in 1920s Harlem as a performance of a “bad” black modernist imaginary to a consideration of Filipino American modernism in the context of anticolonialism. The contributors reconsider familiar figures—such as Virginia Woolf, D. H. Lawrence, Josef von Sternberg, Ludwig Wittgenstein, W. H. Auden, and Wyndham Lewis—and bring to light the work of lesser-known artists, including the writer Carlos Bulosan and the experimental filmmaker Len Lye. Examining cultural artifacts ranging from novels to manifestos, from philosophical treatises to movie musicals, and from anthropological essays to advertising campaigns, these essays signal the capaciousness and energy galvanizing the new modernist studies.